PT Bank BRISyariah - BRIS (hereinafter referred to as "BRISyariah") is one of the country's top 10 sharia banks. The bank is positioned inside the top three of Indonesian sharia bank in terms of total assets. According to PT Bank BRISyariah Annual Report 2015 as cited by JobsCDC.com, BRISyariah reported total assets of Rp 24,230.24 billion in the end of 2015 or an increase of 19.19% from Rp 20,341.03 billion in the end of 2014. PT Bank BRISyariah is an islamic banking subsidiary company of PT Bank Rakyat Indonesia (Persero) Tbk (BRI Group), the second largest banks in Indonesia which is majority owned by the Government of Indonesia. As today, BRI Group is the majority shareholder at PT Bank BRISyariah, with 99.999966% of ownership with the remainder of the shares belonging to YKP BRI. Headquartered in Jakarta, BRISyariah runs its business through 52 branch offices, 208 sub-branch offices, 11 cash offices, 675 sharia service offices throughout Indonesia. In term of financial performance, BRISyariah’s business results in the period of 2015 showed improved performance compared to the same period at 2014. Referring to its annual report, BRISyariah’s total comprehensive profit experienced growth to Rp 169.06 billion in 2015 from Rp 10.37 billion in 2014. Male/Female with the maximum age of 25 years old for Bachelor Degree (S1) graduates and 28 years old for Master Degree (S2) graduates. Already completed the study, by attaching a Diploma or Certificate of Graduation (SKL). Possess a minimum cumulative GPA of 3.00 on a 4.00 grade scale (for S1) or 3.20 on a 4.00 grade scale (for S2). Applicants must be graduates of S1 / S2 all majors: except Medicine, Dentistry, Veterinary Medicine. Have a TOEFL-ITP (Institutional Testing Program) score of at least 400. Willing to be placed throughout the office BRI Syariah. JobsCDC.com now available on android device. Download now on Google Play here. Please be aware of recruitment fraud. The entire stage of this selection process is free of charge. 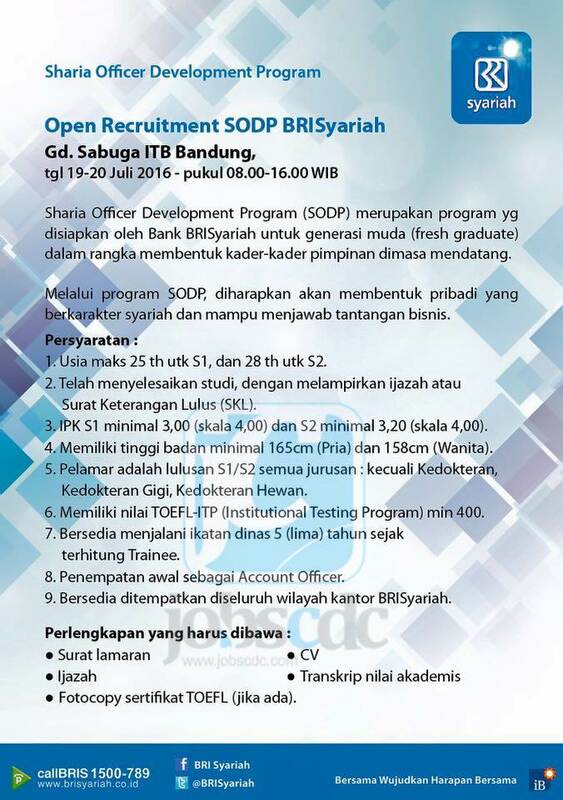 PT Bank BRISyariah - Sharia Officer Development Program BRI Group July 2016 will never ask for fees or upfront payments for any purposes during the recruitment process such as transportation and accommodation.